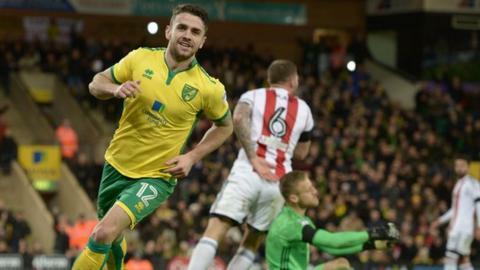 Burnley have broken their transfer record to sign midfielder Robbie Brady from Norwich City for a fee that could reach £13m. The Republic of Ireland international, 25, has signed a three-and-a-half-year deal with the Premier League side. The Clarets' previous club record was the £10.5m deal for midfielder Jeff Hendrick from Derby County in August. Brady joined Championship side Norwich from Hull in July 2015, having started his career at Manchester United. He has made 26 appearances for the Canaries this season, scoring four goals. There will be mixed views from Norwich City fans over the sale of Brady to Burnley. On his day, he was the club's best player but that day didn't seem to come along too often. This time last year, as City fought against relegation from the Premier League, Brady was a leading light. A tricky, clever winger with excellent dead-ball abilities - but more often than not he found himself in an unfavoured left-back position. As the season wore on, it became clear that the Irishman had half an eye on representing his country at Euro 2016. It was at this tournament where Brady came of age, arguably one of the best players of the group stage. He signed off at Norwich with a trademark whipped free-kick against Birmingham on Saturday, which was headed in by big defender Timm Klose in a 2-0 win at Carrow Road. That was one of only few highlights for him this season - Burnley have got themselves a very good player who frustrates and excels in equal measures.